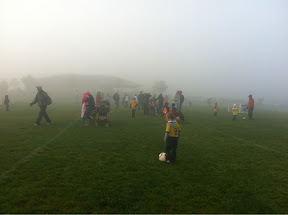 20111022 - Up and out into the 35 degree fog with G for his last soccer game. He did great, got 3 goals and tons of assists. We got home and hung out a bit. L headed to the grocery and the joys and I hit a buddy's garage sale and Blockbuster. 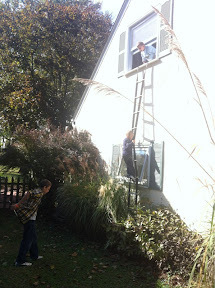 Home and Did our Fall Fire Drill. Second was J's choice and we played flag football. Teams were D&J vs LG&I. It was a tough rough game, but ended in a tie, 21 to 21. 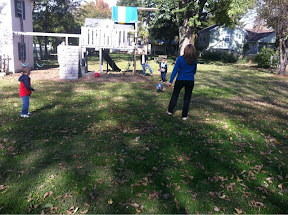 Third was D and he wanted to play baseball, but there are not enough of us so we just played catch for a bit. All in for some homework and rest. Then it was my turn. 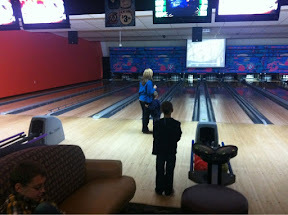 I loaded them all up and we headed to the bowling alley for pizza and pins. L was the big winner of the night with a top score of 110! 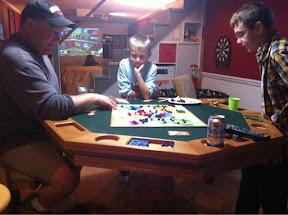 Home for quick refresh and then Pettit's are coming over tonight to watch a football game and play Risk. 20111030 - Work and NEW BABY! 20111024 - Scout take over the City!